As the old saying goes, however, where one door closes, a window opens. While we will no longer function as a State Historic Site, the history of the site will live on as the Alexander Hamilton's Father-in-Law's American History Fun-Land, under the ownership of American History Enterprises. This new 18th century-themed attraction will begin construction on the 2-acre lot currently occupied by the historic site in Spring of 2018, and intends to bring the excitement and patriotism of the American Revolution to a broad audience in the Albany area through historically themed carnival attractions. "Sites like Schuyler Mansion are an essential part of the American historical landscape," says A.H.E. director Samuel Peters, "We are excited to help preserve this part of our past for future generations. We're just going to improve the presentation- make it more accessible. Pop-history and historical tourism really are the wave of the future, and that's what we plan on bringing to the Capital region with this interactive opportunity." 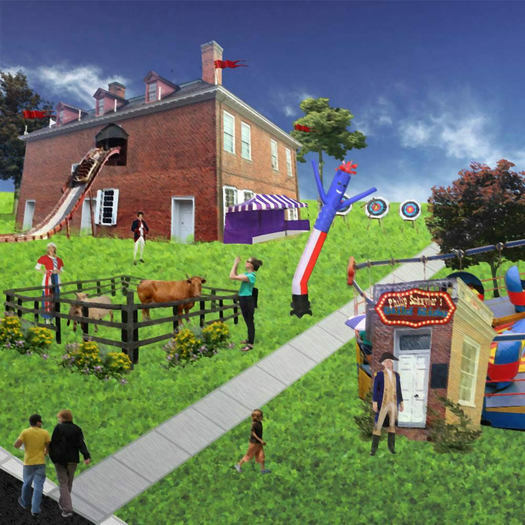 Plans for the site include family-friendly theme park and petting zoo designed to recreate the experience of visiting the 90+ acres of farmland that once surrounded the Schuylers' elegant Georgian home, in a condensed form. Activities will include an opportunity to visit the recreated home of a tenant farmer, watch an ox-team at work, and an axe-throwing range where you can try your hand at throwing tomahawks such as the one that nearly hit Peggy Schuyler during the 1781 British attack on the house. "I'm particularly looking forward to the Mansion Mills log flume ride myself," says Peters. The historic site is very much not being sold. And it's currently open for tours by appointment through mid-May, when it will switch over to its summer schedule. By the way: The Schuyler Mansion State Historic Site's blog has been turning some really interesting posts lately, including the most recent about "elbows, ankles, and dÃ©colletage." Joke's on them. Schuyler Mansion should become a family-friendly theme park which has a petting zoo, axe-throwing range, bumper carriages, and a log flume ride. I'd definitely go.